I’m plodding along with the GAZ Blanket. 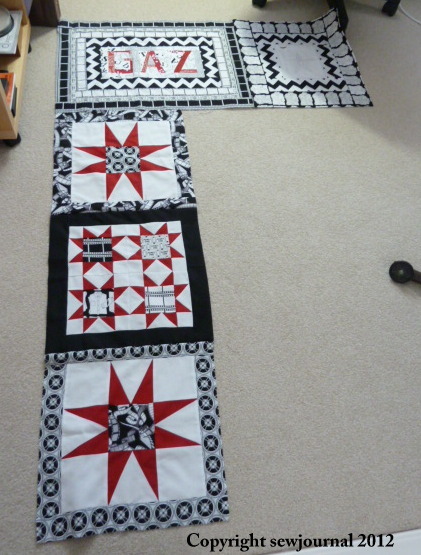 I’ve made three star blocks and sewn them together. I haven’t decided where to place them just yet but I’ve taken a photo so you can see them in one possible position. What do you think? I designed a clapper board block in EQ6. I have to say I wish someone would come up with a really intuitive easy-to-use quilting app. I’ve written software for a living and I find EQ very un-user friendly. Maybe that’s just me, maybe you really like it – horses for courses I guess. 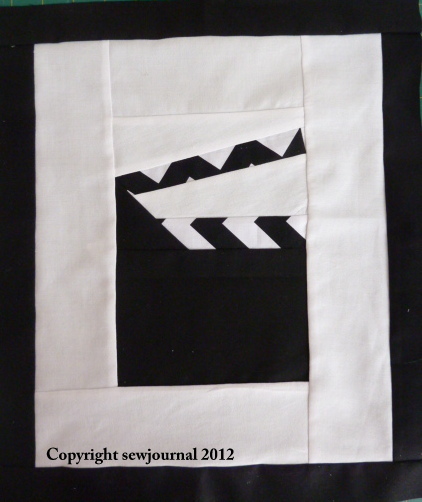 I foundation paper pieced this block. Oh my goodness!!! You all know I’m spatially challenged and I can’t tell you how many seams I undid and re-sewed. I need to find a better way of doing this. Anyway here is the block. i plan to embroider on it. Hmmm. That’s a good question. I’m not sure really. This is an improvisational quilt which is hard because you have to try to fit stuff into spaces that can turn out to be strange measurements but I like a challenge. I’ll keep you posted.